A bit of a departure from the normal Two-For Tuesdays, today, gals. Rather than show a product duo, I'm going to discuss a shampoo and conditioner pairing that is not to be matched! 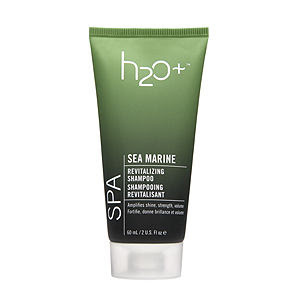 I speak, of course, of the H2O Plus Sea Marine Revitalizing Shampoo and H2O Plus Sea Marine Collagen Conditioner. Ever since this one-two punch came into my life, I haven't been able to stop washing my hair! Now, I know what they say. You shouldn't wash your hair every day or it will strip your color, weaken your strands, cause breakage. But this duo is so gentle on my tresses, I feel my head of hair actually looks forward to the next day's washing and would be sad without it. Not to mention each product smells absolutely fantastic -- fresh, clean and utterly zesty. The shampoo and conditioner are each formulated with sea lettuce, nori, wakame, sea fennel and marine collagen amino acids to revitalize and renourish dead strands. Vitamins B and E work to moisturize and condition each strand to your heart's content. The end result? Lustrous, shiny, silky locks that literally bounce as you strut down the street. The bottles are chock-full of product and will last you for months. (And this comes from a gal that likes to pour capfuls of conditioner over her head!) Trust me -- your tresses will thank you.